Pickard Chilton, an award-winning architecture studio best known for its innovative and cutting-edge design of corporate headquarters and campuses, announced the completion of 1144 Fifteenth Street, a $300 million, 40-story office and retail development in Denver, Colorado. 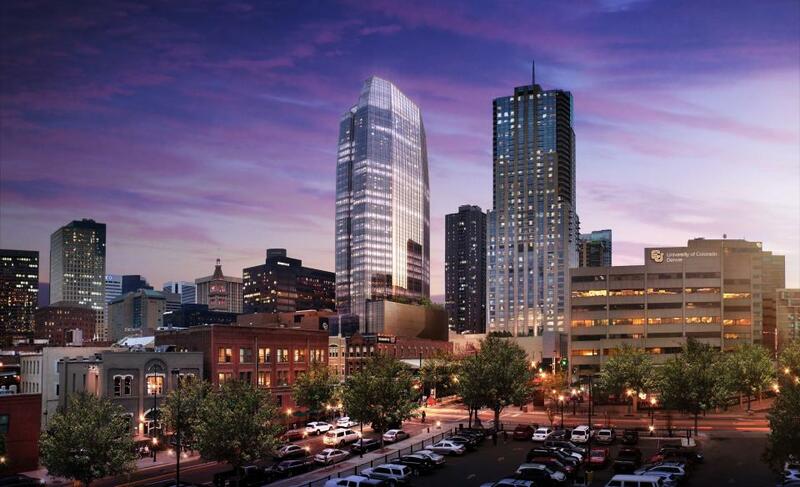 The first new office tower in the market in nearly a decade and the tallest office skyscraper added to Denver’s skyline in 30 years, 1144 Fifteenth Street’s forward-thinking aesthetics and design represent a game changer for the city. The property features a design evocative of the surrounding Rocky Mountains. 1144 Fifteenth Street’s façade and 10-foot floor-to-ceiling windows provide abundant natural light as well as unobstructed mountain and city views. Pickard Chilton was commissioned to design the tower by Hines, the global real estate investment, development and management firm. It includes 27 floors of Class-A office space atop a 13-story podium that will host retail, restaurants, and 5,000-square-foot fitness center, along with 840 parking spaces and auto detailing service. Pickard Chilton designed the LEED-CS Gold 1144 Fifteenth Street as the future of the workplace, offering a free-flowing, flexible and sustainable environment, accompanied by a double height daylit lobby that will serve as a hub for innovation and collaboration. The building has achieved great success attracting commercial tenants (65% leased prior to completion), and will serve as the corporate headquarters for Chipotle, Optiv, and the Gates Corporation. 1144 Fifteenth Street is Pickard Chilton’s second major commission in Denver. The firm also designed 4600 South Syracuse, an office building situated within the Denver Technology Center, overlooking the Rocky Mountains.